The review of findamental ideas based upon "Weapons of mass instruction" by John Getto is presented in this article. Attention is drawn to defects and troubles of contemporary school studying. The author's speculation is concentrated on repressive gist of teaching, which is considered as compulsory discipline and killer routine for pupils. Schools are genuine factories for the development of inflammation. Individuality of children, their dreams and thoughts, personal qualities remain unclaimed. Genius is suppressed in educational institutions because teachers do not know how to manage with it. The pedagogue comes up with the idea that up-to-date schools make children stupid instead of giving them the possibility to develop. John Gatto point out several tips for powerful progress of qualitative education. The cornerstone of his cogitation is considering school as environment for child's development. Creating yourself is the most significant task for the pupil. The researcher suggests "education of accessible sources" instead of normative, universal, "controlled" schooling. Students get the ability to create new ideas, experiences, things, revealing the truth through evidence, and not remembering the thoughts of other people. In this way of teaching, teaching is a function, not a profession. Teachers can also act as students, provided them to have certain knowledge or experience of the problem. In such a study, they are active initiators and participants in the educational process, creating their own scenario of their education. To limit such training to any requirements or algorithms means to destroy its essence and purpose, to cling to the strong grip of an official position. Such education is based upon experience, individual ambitions and questions. It gives an opportunity to take control of studying process on pupil's own. The ideas presented in the book by J. Gatto are not radical, but rather fundamental to any process of cognition. They are aimed to encourage as many people as possible and to make changes in education. These ideas and thoughts are important for Ukrainian education, as they will promote the development of the individual freedom of those who want to learn, bring them to life in the situation of freedom and full responsibility for their decisions and deeds. The ideas of the teacher are valuable for us and for allowing the education to fulfill its special historical mission - to become a decisive factor in the transformation of society. 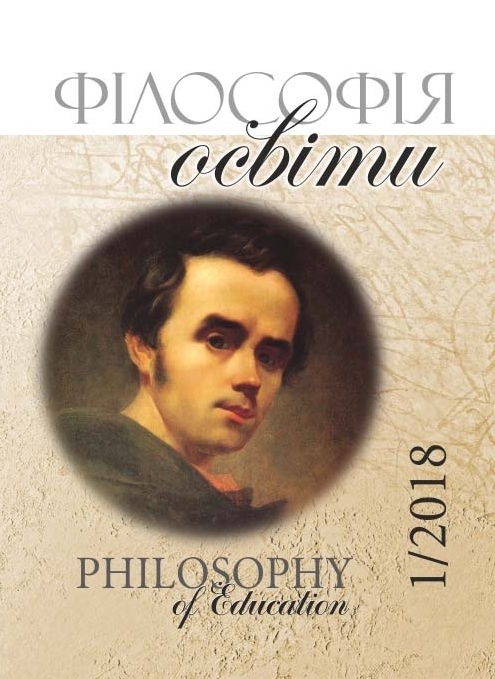 Doctor of philosophical sciences, Associate Professor, Associate Professor of the Department of Philosophy Kamyanets-Podilsky Ivan Ohienko National University, Ukraine. Gatto, J. Taylor (2016). Weapons of mass training. The journey of a school teacher by dark worlds of compulsory schooling. Translation from English by Galina Stashkiv. Lviv: Litopus [In Ukrainian]. Dewey, J. (2003). Democracy and education. Lviv: Litopys [In Ukrainan]. Proleiev, S. (2007). Repression of Education: Forced NeceSSity or Socium’s Power Intentions? Filosofiya osvity. Philosophy of Education, 1(7), 17 – 27 [In Ukrainan]. Robinson, K. (2013). Education against Talent. Translation from English by Natalia Makarova. Moskow: Publishing house "Mann, Ivanov and Ferber", Publishing House "Exmo" [In Russian]. Foucault, M. (1999). Supervise and punish. Trans. from French by V. Naumov, ed. I. Borisova. Moskow: Ad Marginem [In Russian].